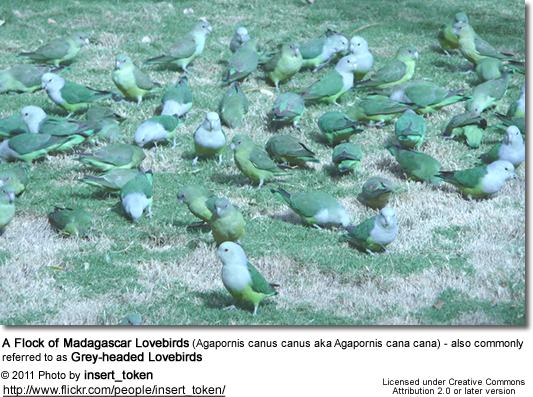 The Madagascar Lovebirds (Agapornis canus canus) are also commonly referred to as Grey-headed Lovebirds. They are native to the island of Madagascar off the coast of Africa. Small numbers of them may also be found on neighboring islands. Isolated sightings have been reported on the mainland of South Africa. In the wild, they typically occur in large flocks, however, captive colony breeding has not been generally successful. They are usually bred in pairs. Madagascar Lovebirds are not prolific breeders - adding to it the export restrictions from their native country as well as the challenges associated with breeding this species - this species has become very rare outside their natural range. The Madagascar Lovebird weighs about 25 - 36 grams (0.8 - 1.3 oz) and has an average length of 13 - 14 cm (5 - 5.5 inches) - including its tail. It is the smallest of the lovebird genus - except for the Black-collared Lovebird found on mainland Africa which even though it has the same length is somewhat bulkier. Its beak, legs and feet are pale grey. The irises are dark green. 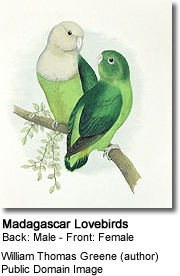 This is a sexually dimorphic lovebird species, with distinct visual differences - the male can easily be identified by his grey upper body, while the female is all green. Lacks the gray patch on her forehead. She is entirely green, with a dark green back and wings. She has a bright green rump and a paler green chest. They look like adults, except the male's grey head is washed with green. The beak is yellow with black at the base. Madagascar Lovebirds are excellent flyers that can develop high speeds pretty quickly. In their natural habitat, the Madagascar lovebirds line their nest chambers with chewed leaf fragments, wood shavings, or grass stems that the female tucks into her body feathers to carry to the nest. They tend to be nervous even when hand-fed, and are easily frightened in an aviary. Their shy disposition doesn't make them good prospects as pets. For this reason alone, any captive specimen should be placed into a breeding program to ensure that future generations are going to survive. These lovebirds have shown a preference of finch and canary seed over the typical sunflower/safflower mixes that most other lovebirds are fed. The calls made in flight or at roost before nightfall are shrill and metallic. A quiet chattering may also be heard. When alarmed, they emit high pitched notes. Little is known about this bird other from the few specimens that are currently kept in private and zoo collections. Breeders state that this species is difficult to breed and recommend that this task should only be attempted by the most experienced aviculturists as this species is very delicate and as so little is known about their proper husbandry. Even hand-fed birds tend to remain shy and nervous, and this species of lovebird may be better suited to aviary living than being kept as companion birds. 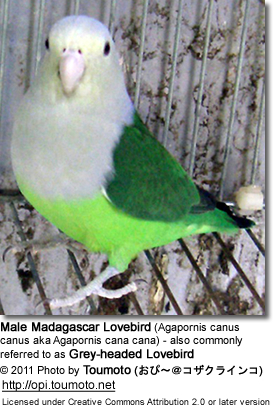 Since this lovebird is so endangered, experts would like to see any captive Madagascar lovebirds be placed into a well-managed breeding program to ensure species survival. However, if there is an individual that isn't able to breed and you are considering it as a pet or for your aviary, the following may be of interest. Lovebirds can start breeding when they are as young as ten months of age and may continue until they are five to six years. They are very prolific and may produce several egg clutches within a single year. Due to this, they are usually readily available on the pet market. During breeding season the behavior between partners will change: the male displays a more aggressive behavior, while the female begins preparing the nest. There are specific nesting boxes for lovebird-size birds, but if not available a cockatiel nesting box will do just fine. Samples of available nest boxes. The nests are almost entirely constructed by the females. A clutch generally consists of three to six eggs that are incubated for about twenty-three days. The chicks will be cared for by the female until they leave the nest at about six weeks of age. The father then takes over the feeding of the young birds for another two weeks or so until they are weaned.